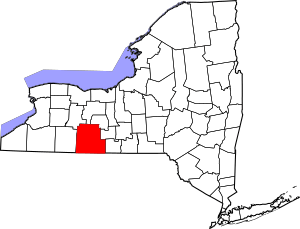 This is intended to be a complete list of properties and districts listed on the National Register of Historic Places in Steuben County, New York. The locations of National Register properties and districts (at least for all showing latitude and longitude coordinates below) may be seen in a map by clicking on "Map of all coordinates". (#80002771) Tuscarora and South Sts. Hornell The house was demolished on June 15, 2010. Bath Well-preserved 1909 Queen Anne Style house has many of its original interior finishings. (#83001795) 225 E. Steuben St.
(#04000707) Southeast side of hill, north of Cemetery Rd. off Greenwood St.
(#92001577) Junction of Park and Wall Sts. (#83001796) 120 W. Washington St.
(#11000754) 14681–14697 Keuka Village Rd. (#91001674) Junction of Steuben St. and Victory Hwy. (#01000242) 9436 Dry Run Rd. (#91000235) Junction of Cohocton St. and Railroad Ave.
(#99000088) 130 W. Water St.
(#83001798) E. Steuben and Gansevoort Sts. (#00001289) 8299 Pleasant Valley Rd. (#04001052) 16 W. William St.
(#73001270) 59 W. Pulteney St.
(#83001800) Roughly Liberty St. from E. Morris St. to Haverling St.
(#96000488) Main St. from the Canisteo River to the junction of Main, Steuben, Tuscarora, South Sts. and Valerio Pkwy. 00001152 (increase)) Market St. from Chestnut St. to Wall St.
(#83001801) 207 E. Washington St.
(#83001802) 4 W. Washington St.
(#99001364) Roughly surrounds Pulteney Sq. (#14000094) 123 W. Morris St.
(#83001803) 16 W. Washington St.
(#83001805) 110 W. Washington St.
(#98000137) Roughly bounded by NY 17, Chemung St., Spencer Hill, and Washington St.
Hornell 1946 synagogue, currently vacant, reflects Jewish settlement in small towns across upstate. (#88002395) 135 N. Hamilton St.
(#03000593) 145 E. Front St.
(#02000877) 8329 Pleasant Valley Rd. (#80002774) 01985-10-24October 24, 1985 508 Water St.
National Register of Historic Places listings in Steuben County, New York Facts for Kids. Kiddle Encyclopedia.